It’s summer and we’ve got sunshine, which leads me to a question: What do you know about the SUN OVEN? 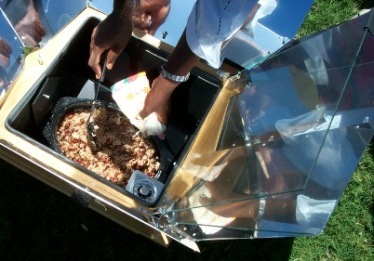 In a nutshell, a sun oven (aka solar oven) harnesses the natural power of the sun to cook or bake, unbelievably, the most delicious food while at the same time providing emergency preparedness, reducing energy costs, and benefiting the environment around the world by reducing the carbon footprint. 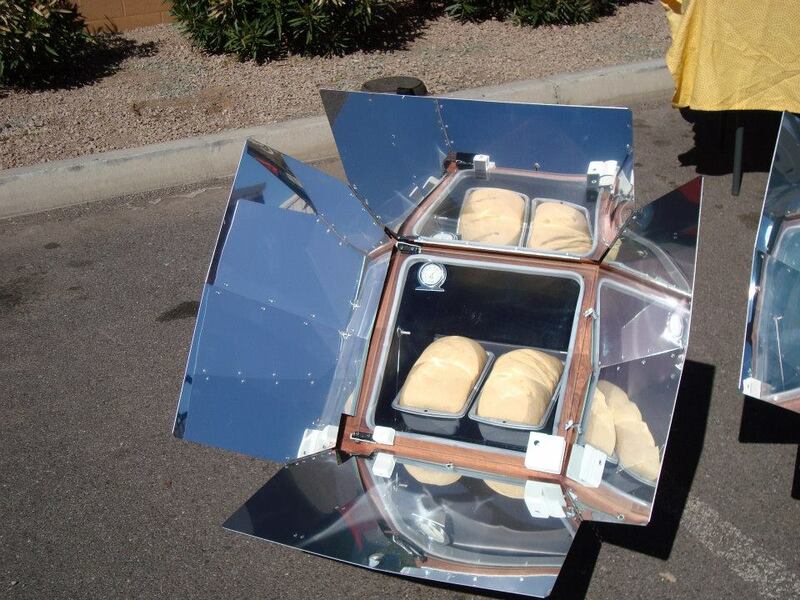 And what can you cook in your solar oven? Just about anything. You can bake, boil, steam, stew, and even dehydrate! (OK, you can’t really fry anything in it, but you’ll feel better not eating those greasy meals anyway.) It’s a wonderful feeling producing a hot, nourishing meal using nothing but the sun’s life-giving rays. Fire safe! No open flames. No fossil fuels or air pollution — 100% sustainable. No stove heating up indoor spaces on a hot summer’s day. Saves on the electricity or gas bill. Low-maintenance cooking: stirring rarely needed during cooking, as food almost never burns or sticks! Fun for kids and great teaching tool for renewable energy and thermodynamics. Portable: great on camping trips, particularly where camp fires are discouraged. Encourages time outside — dinner simmers while you garden or catch up on reading under a tree. All this makes good sense, but I wondered if this type of cooking was hard to learn. What my sun-oven friends told me was that in the beginning you want to focus on recipes that do well with slow cooking. 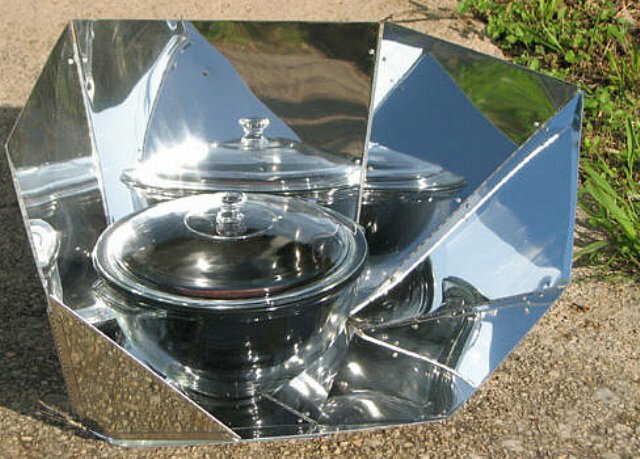 Solar ovens really shine with long-simmered stews and casseroles; the sun seems to bring out new flavors as the steady heat breaks down the complex carbohydrates of separate ingredients into a symphony of well-mingled sweet and savory notes. The best practice is to choose dishes where you won’t miss the browning that takes place in a conventional oven. A dusting of paprika or a sprinkling of herbs can provide extra visual appeal on dishes that might ordinarily be browned on top. Since the oven is designed to retain moisture and prevent baked goods from drying out, it’s much harder to overcook foods in a solar oven. So patience is a virtue here. You need to wait until you’re pretty sure your dish is done before checking, since every time you open the oven heat will escape and 10-15 minutes of cooking time will be added to regain temperature. For cooking something quickly or at high temperatures, you do need to tend the oven and reorient it every half-hour. Just look for the shadows — they should be even on all sides of the solar oven for optimum sun exposure. When solar cooking, you work around the mid-day sun. You check the focusing position for mid-day sun and make a note for future use. And then when slow-cooking your dinner while you’re at work, hiking, or otherwise occupied, you’d set the oven in that mid-day sun position before you leave in the morning. And there’s no special equipment required — just a bowl, a spoon, a covered baking dish, and a sense of adventure. Most traditional slow cooker recipes will tolerate some temperature variation and still turn out delicious, so why not give this idea a try? 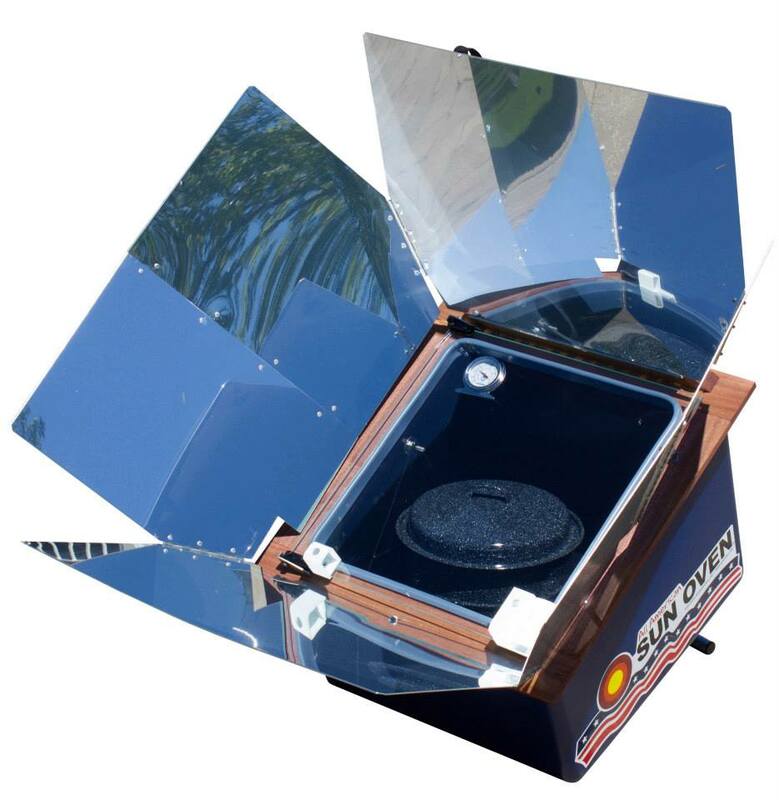 It’s easy to get sold on this solar cooking idea, except for the price issue. 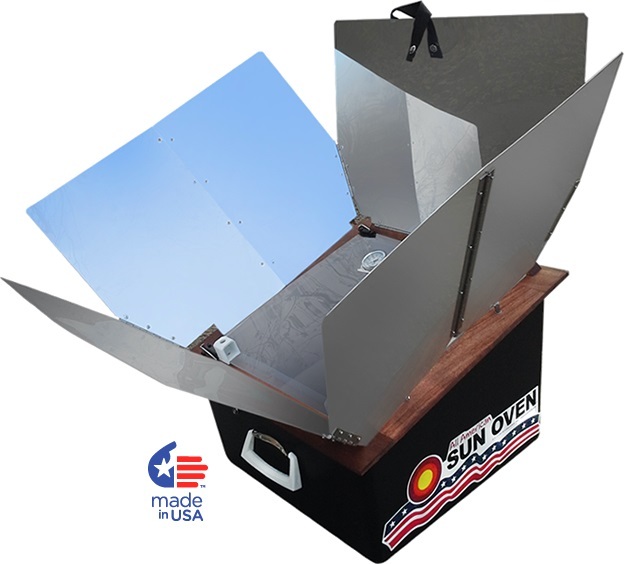 On the Earth Easy website (www.eartheasy.com), I found the All American Sun Oven for $294, a $55 savings (it retails for $349). There are other brands available, but the reviews and research I did pointed over and over to the All American as being customer preferred. However, the internet is chock-full of plans and videos on how to make an inexpensive solar cooker, and less expensive knockoffs are available. 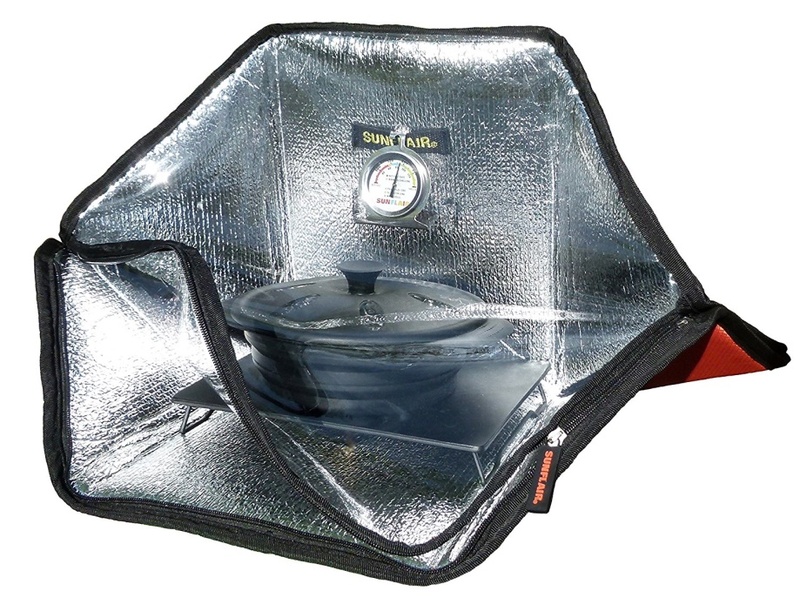 For instance, you can find the Sunflair Mini Solar Oven for $79.99 on amazon.com. So this prompts the question, “Why would anyone spend more for an All American SUN OVEN®?” Consumers say the All American is easier to use, cooks quicker, lasts longer and costs less per meal than any other type of solar cooking device. And personally, I like the idea that it’s made in America. 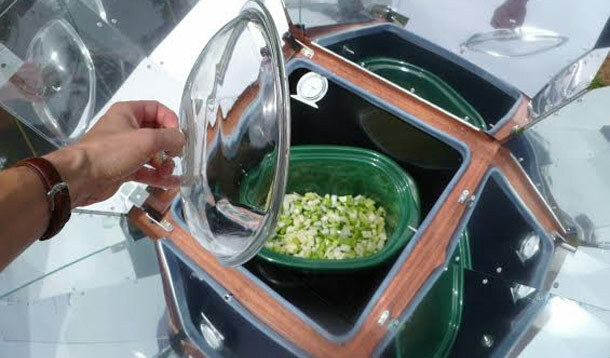 So whichever route appeals to you most, the popular All American Sun Oven, a less expensive model, or making your own, do seriously consider this idea. If you’ve got sun, why not look at putting it to work!